Being frugal is a lifestyle and a mindset. But, what really defines being frugal? If you ask two different people, you’re likely to get two different answers. For most, being frugal means being mindful with your money and being resourceful with what you have on hand. For some, it may mean learning to live with less or living within a budget. You may start living a more frugal life by looking at an aspect of your life like your grocery shopping. So what else does it mean to be frugal? 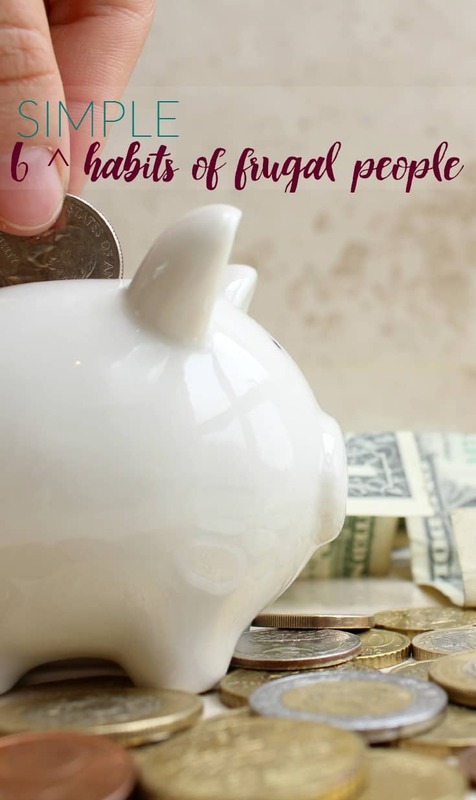 Let’s take a look at these simple habits of frugal people and find out. There is a lot of advice out there on how to live a frugal life. You can go from anything as simple as turning off the lights when you leave a room to grinding your own flour. There are forums out there where people discuss the way they use the rainwater they collect to do everything from watering plants to flushing their lavatories. How frugal you are depends on your lifestyle. In my opinion, all it takes to be considered frugal is to think before you purchase something. You can simply turn down the heat at night and save a little on your utilities to be frugal. You can shop sales. You take the time to ask yourself if you really need something. Being frugal isn’t about washing out Ziploc baggies and reusing them. It isn’t about grinding your own wheat or collecting rainwater. It isn’t even about that sweater you didn’t buy. saving money and managing your finances. And since every household has different finances,we all have different goals. The point is that every household has to look at their own situation and then decide where they can – or need to – become more frugal. Frugal living doesn’t mean doing without. It doesn’t mean that you don’t have what you need. In fact, it means the opposite. Frugal living is about reducing what you spend, living within your means, using what you have and taking care of your belongings, including your money. It is about making goals and working to reach them. Which would you rather be: the person who decides when and where to spend his money or the person whose money is spent before he makes it? Take the time to look at how you spend. Your spending is more important than your income. You can make $100,000, but if you spend $120,000, you are in trouble. It will eventually catch up with you. You have to spend less than you make, and that is what being frugal is about. Living with what you have. It is easier to spend less than it is to make more. It is easier to be frugal than to juggle credit cards and lenders. Find the frugal methods that work for your family and start saving today. Frugal living requires skills and ways of looking at things that help you take advantage of the money-saving opportunities in life. The truly frugal person makes these into habits. Six of these simple habits are outlined below. These are techniques that can be learned in a matter of a day or two, and made into new habits a few weeks. Then they will save money for you for the rest of your life. 6. Tell people what you need. Mention it in conversations. Many people get free or cheap things, just because they talk. For example, maybe your neighbor is getting new furniture and needs to make space. Maybe you need new furniture. You could easily take their old furniture of their hands for free or cheap. A win-win for you both, don’t you think? So what do you think of these simple habits of frugal people? Do you recognize any in yourself? I agree with all of these! It was only when we went down to one income last year (only for a couple of months, phew) that I realised how much money we were wasting unnecessarily. Even simple things like eating out during the day rather than the evening has saved us a bundle, with no real sacrifice.